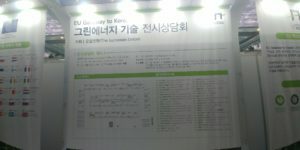 On January 22nd – 23rd, EU Gateway to Korea ( Green Energy Exhibition ) was held in Coex Intercontinental Hotel. This Exhibition were supported by EU. 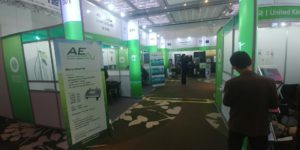 At this exhibition, the companies from around 50 European countries that utilize and succeed to commercialize green energy and renewable energy were presented. The companies had various technological background such as wind power, solar power, tidal power, hydroelectric power, biomass, energy management & control and etc. Most of the companies that participated in this exhibition were midsize or small size enterprises but with strong technological background that want to seek business opportunity and wish to find adequate partner in Korea. During the Exhibition, people who registered for the Business meeting with a company, they were able to have a one on one business meeting with the firm to maximize the matchmaking. And if the company was not occupied with the pre-set meeting, anyone could join the company for the business meeting. Overall, it was great opportunity for European companies to seek for new opportunity in Korea and for Korean business people as well.